Rare Planning Natal Killer Instinct? Rare top brass talks about Killer Instinct, and how it would have to do something different with the franchise if it were to revisit it. It's been thirteen years since the last Killer Instinct game, and Rare seems to be thinking that it might just be time for a new one. "It's about timing, and it's about the opportunity creatively and gameplay-wise that it would offer," said Rare studio head Mark Betteridge. "Street Fighter IV looked great and they've done a great job, and I'm a big fan of those products, but with KI we want to do something different rather than go back into that arena." "I think it's about doing something different than with a conventional controller," he added. 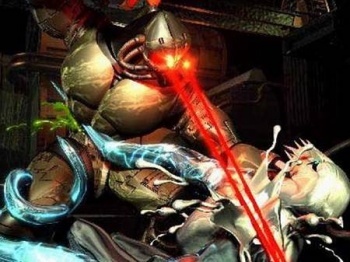 Since Rare, and the Killer Instinct IP, has been gobbled up by Microsoft, it seems likely that any new Killer Instinct games will be Xbox 360 exclusives, much like the original two games were Nintendo exclusives. Fans have been clamoring for a new KI game for years, but if what Betteridge is saying does turn out to mean a Natal based game, would fans accept it?